When the opportunity to work with director Kenneth Branagh on Jack Ryan: Shadow Recruit came along, Keira Knightley jumped at it. The actress had wanted to work with Branagh for years - indeed, she points out that one of his earlier films, Much Ado About Nothing, inspired her to take up acting in the first place. But there was another reason why Jack Ryan appealed, too. Quite simply, she wanted to have some fun after years of playing a series of heavy duty roles in films like Anna Karenina, A Dangerous Method and Never Let Me Go. “For a couple of years now I’ve wanted to do either something that is complete popcorn or something that is incredibly positive because I got to the end of about five or six years work having died in pretty much everything,” she laughs. “Everything was doom and gloom and I just wanted to lighten it up a bit so this was part of it. This is my popcorn, very Hollywood thriller that I wanted to do for fun, that sort of thing. “And it ticked all of those boxes and it’s the first time I’ve been anywhere near anything with a larger budget since the last Pirates of the Caribbean film, which was about seven or eight years ago, so it was dipping my toe back in that water. As well as directing, Branagh also stars in Jack Ryan: Shadow Recruit, as Russian oligarch, Viktor Cherevin, who plots to cause havoc on the world’s stock markets. Jack Ryan (Chris Pine) is a newly recruited CIA analyst who discovers Cherevin’s plan to wreck the US economy and Ms. Knightley plays Cathy, his fiancée. Ms. Knightley revealed that her links to Branagh the filmmaker go back a long way. She first auditioned for him when she was a young girl, just making her way as an actress, and always remembered the kindness he showed her back then. “I met him once when I was about 11 years old and I went up for Hamlet and I remember him being absolutely lovely to me. I remember knowing that I hadn’t got the job,” she says. “It was for one of the Players in his film version of Hamlet and I knew I hadn’t got the job pretty much from the get go but he still took the time to show me models of all the sets and he was absolutely lovely to me and he sat there and talked about what he was going to do. “And I remember appreciating the fact that he had taken the time out, even though it was pretty clear I wasn’t going to get the job, to sit there with an 11 year old and have a talk with her and treat her like a human being. “I’ve been a huge fan of his because one of the films I got obsessed by when I was growing up was Much Ado About Nothing. It’s a great version and I used to know it off by heart – I wish I still did because that might be quite helpful one day but I don’t. On set, Branagh switched effortlessly between his dual roles behind and in front of the camera, she says. “It’s absolutely fascinating but really strange particularly when you are doing a scene with him because he will be going from Russian baddie kind of psychopath and then he’ll suddenly switch off and be like ‘oh OK, ladies and gentlemen, thank you very much and that’s a cut..’ and being this really polite, quiet sort of contained director. “And then on the other side he’s the actor, too. And a lot of times when you are working you need to create energy so there is quite a lot of banter that can happen between actors and so he’ll go in for that, too. “So there will be the actor banter just before a take and then he’ll go into playing the psychopath and then he will switch back to the director and you are watching it going, ‘wow!’ It takes a lot of energy to do that, it’s quite extraordinary. 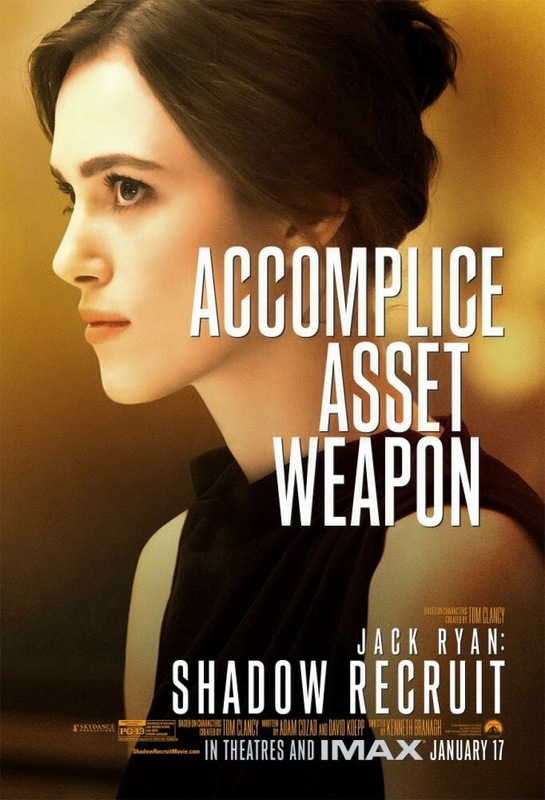 Ms Knightley has always loved well-scripted, intelligent thrillers and Jack Ryan: Shadow Recruit has all the hallmarks of the genre and fits the bill perfectly, she says. “I’ve always loved thrillers and I love the challenge of a thriller because they need a good storyteller to make them. And there are very few thrillers made nowadays unfortunately. “If you look back to the 80s and 90s thrillers were all the rage and we really don’t make that many of them anymore so I was really excited to try that with Jack Ryan. Branagh has won huge acclaim for directing and appearing in many of Shakespeare’s plays on both stage and screen. But, as Ms. Knightley points out, he also loves contemporary stories and has directed thrillers like Dead Again and blockbusters like Thor. “And this is a Hollywood thriller – there was no pretending that we were doing Shakespeare, we all knew exactly what we were doing and he was very clear about it,” she says. “And there was no guilt or going, ‘this should be something different.’ It was like, ‘we are trying to make the best kind of Hollywood thriller that we can possibly make. That’s what we are trying to do so let’s do it…’ And I really like that. “I like the lack of pretence and the clarity of that. I was hugely impressed by Ken. And what I love about him is the acts that his career has had. To be this guy that directed Thor and now Jack Ryan and Cinderella next, the same guy that did all the Shakespeare, a man who is generally regarded as one of the best stage actors of our time. “He has done a phenomenal amount and his career has had really interesting chapters and I think that’s always great for any actor to see – that there are all these different avenues that you can explore and there are different stages in your career. Ms. Knightley also enjoyed working with Chris Pine who plays Jack Ryan. Her character, Cathy, doesn’t know that her fiancée has been recruited into the CIA – a corrosive secret in their relationship. “I think from my character’s perspective the story is about what happens to your relationship when you are with somebody who is keeping a secret. Cathy doesn’t know what the secret Jack is keeping is but of course the audience will know that he is a CIA officer and he can’t tell anybody. “Jack and Cathy aren’t married yet so he can’t tell her but she knows that something is going on and so her mind goes to all sorts of different places and it’s about the pressure that is put on that relationship by that secret. “And I thought that was very interesting because it would put pressure on if you don’t even know what your partner is doing and also, if she does find out, she hasn’t chosen that life for herself and obviously it’s a dangerous life. 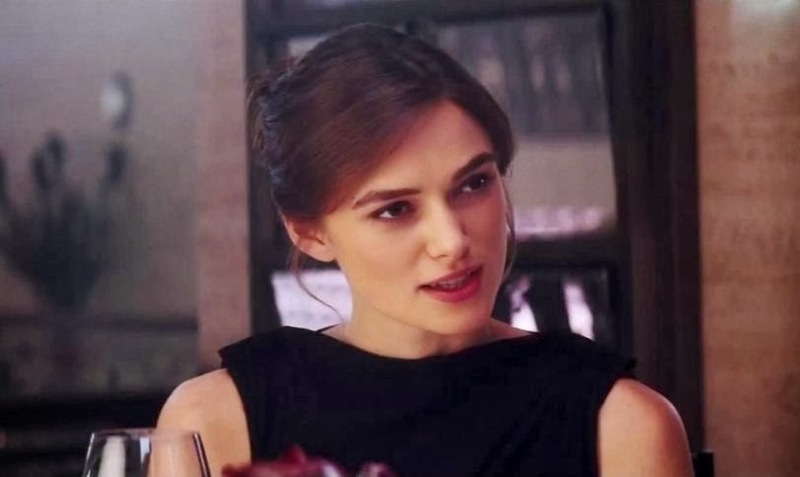 The daughter of actor Will Knightley and playwright Sharman Macdonald, Ms. Knightley was born in London and made her professional acting debut in 1993 in the British TV series, Screen One. Keira Knightley earned Academy Award and Golden Globe Award nominations for her portrayal of Elizabeth Bennet in Joe Wright’s version of Pride & Prejudice, based on Jane Austen’s novel, also for Focus Features and Working Title Films. Two years later, she was a Golden Globe and BAFTA Award nominee for her performance as Cecilia Tallis in Atonement, again directed by Joe Wright and for Focus and Working Title, based on the novel by Ian McEwan. In November 2012, she stars in the title role of Anna Karenina, reuniting with Mr. Wright and Focus, based on the novel by Leo Tolstoy and adapted by Academy Award winner Tom Stoppard. Check the movie review of "Jack Ryan: Shadow Recruit" here. United International Pictures through Solar Entertainment Corp. SHOWING on JANUARY 15, 2014.